Good news from the misguided cult members who delivered Travolta-endorsed junk science to a quake-ravaged Haiti: Scientology "volunteer ministers" are in Japan, touch-healing homeless tsunami victims, according to a celebratory press release issued today. 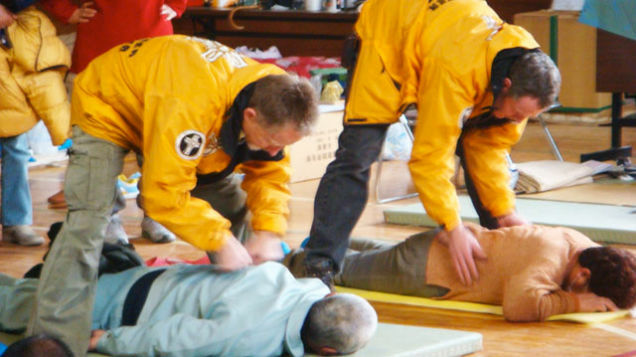 Since the disaster struck, the Scientology Volunteer Ministers Japan Disaster Response Team has helped more than 48,000 displaced persons in dozens of shelters distributing food, water and supplies and providing Scientology assists. Assists, often described as "spiritual first aid," help the individual overcome the effects of loss, shock and trauma and speed recovery by addressing the spiritual and emotional factors in illness and injury. A Hashikami City Councillor thanked the Volunteer Ministers, saying theirs is a service the Japanese people can find nowhere else.